It's 3DO on a computer but without the use of FreeDo? Yep, it's that obscure piece of 3DO history responsible for lackluster sales vastly eclipsing those of other 3DO players. Quite a nice distinction. 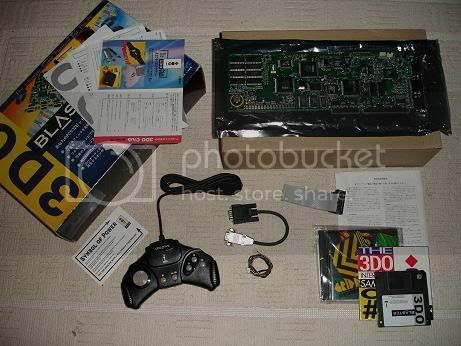 Creative 3DO Blaster. Some other distinctions. It's near impossible to find these days. If you do find one, it is either nonfunctional or missing many components. If you do manage to find one in any form of completeness, you then have to track down the required computer hardware/software not included in the kit. Then you just have to make it work. The 3DO Blaster needs a specific computer with a specific operating system to function. Additionally, it requires a specific video card, specific audio card, EXTREMELY specific CD-ROM (of course, with a specific driver), and a specific amount of good luck - usually large amounts. Some people will ask "why not just use FreeDo", but actually I found it interesting tracking down all the needed components to make this work, and extremely gratifying when it finally fired up. Also, unlike FreeDO (at least, at this point in time) it has played every single game that I have thrown at it with no troubles whatsoever. Patience in obtaining the required components and patience in setting them up. I always wanted one of these ever since they originally came out, but there was no way I could have afforded both the stand-alone console and the 3DO Blaster. How much did it originally cost? I think I remember seeing this in stores... Or maybe I just remember seeing ads. Either way, I always thought it was an interesting but kinda strange way to sell a game system. When it debuted it cost $399, which I believe was the same price as the then marked down consoles. 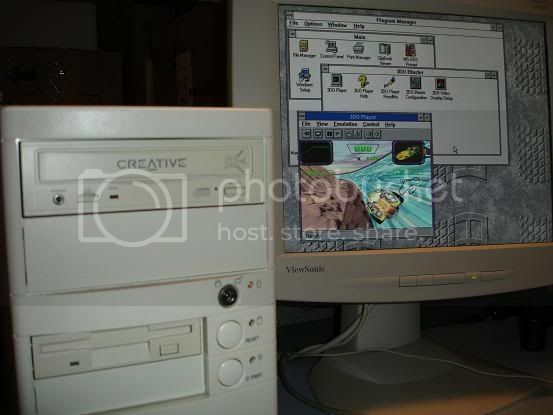 It was said to allow 3DO to expand into the PC market and it allowed Creative to offer an advanced gaming platform to their then extensive installed base of Creative CD-ROM drives. At the time I though it was a nifty idea for 3DO to be released for the PC, it was an example of how quirky and unique the 3DO was, on the downside the poor compatability also gives an example of how shocking some of its marketing was. I've been after tracking it down for a while, but it's too expensive and if it takes that much effort to get it running, then I'm glad I lost a bid on it last year!!! Mobius wrote: How much did it originally cost? Last edited by NikeX on Wed Mar 14, 2007 6:02 pm, edited 1 time in total. sorry, I hit the *quote* button. NikeX wrote: Great pictures bitrate. Sounds like Germany may have gotten a little bit of a break on the cost. Of course, it's all relative to when it was released in Germany. If it had released at that price in the US it might have given people reason to second guess that Panasonic/Goldstar purchase. On the other hand, the simplicity of buying a console and knowing that all you have to do is plug it into the TV and supply power can be very persuasive. I mean seriously, I'm sure we all know how exciting it is to get a new system and I for one can't wait to see those new graphics and hear those new sounds. Bitrate - where can someone dig out a list of the exact components a person would need to get a 3DO blaster running. OS versions, CD roms, etc.? It'd make a good sticky - or something! I would be happy to share everything and develop a listing of all known compatible hardware. I have a US 3DO Blaster, German 3DO Blaster, and a Japanese 3DO Blaster. So software in these languages is available, as is documentation. I just scanned the US user's guide a couple of days ago. Alot of the time people will obtain the 3DO card and not have the manual, so this can be very useful. And I have drivers for the CD-ROM as well as various drivers for the compatible video cards and audio cards. I'll just need a little time to get everything together. I've been looking for one of these for 10 years. There was one on eBay a while ago but I wasn't actively watching eBay and missed out. The sad thing is that I already have the PC to run it in my office. I keep an old ASUS TX chipset board (P-200MMX) with DOS 6.2/WfW 3.11 for playing old DOS games native. I actually pulled a Matrox Mystique out of it a few weeks ago to downgrade to a 1Mb Cirrus board so that I could use a VESA feature connector. I found my old Reveal TV-500 tuner in a box -- still had the floppies and the cables *sigh of relief*. Since the VGA pass through on the Reveal included a pair of RCA composite inputs, I've got my Panasonic FZ-1 in my office run directly to that. I pretty much had to do it this way, because having the 3DO on the same TV as the Wii wasn't helping with my six year old son fighting for Wii-time. Dryden wrote: The sad thing is that I already have the PC to run it in my office. I keep an old ASUS TX chipset board (P-200MMX) with DOS 6.2/WfW 3.11 for playing old DOS games native. I actually pulled a Matrox Mystique out of it a few weeks ago to downgrade to a 1Mb Cirrus board so that I could use a VESA feature connector. You've definitely got the foundation there for the 3DO Blaster. I can supply you with the other required drivers and 3DO software if you like. Then we just need to get you a 3DO Blaster card, the CD-ROM drive, and a couple of cables . We might need to get you a sound card too depending on which one you currently have installed. bitrate wrote: You've definitely got the foundation there for the 3DO Blaster. I can supply you with the other required drivers and 3DO software if you like. Then we just need to get you a 3DO Blaster card, the CD-ROM drive, and a couple of cables . We might need to get you a sound card too depending on which one you currently have installed. I've worked in I.T./Telecom for more than 10 years. Trust me when I say that all I need is the board. 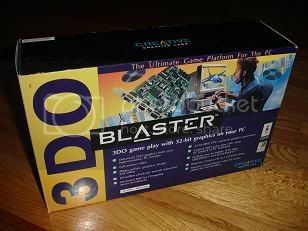 3DOKid wrote: Bitrate - where can someone dig out a list of the exact components a person would need to get a 3DO blaster running. OS versions, CD roms, etc.? It'd make a good sticky - or something! 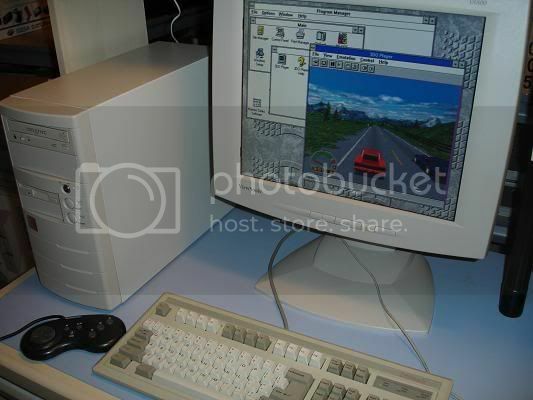 It's pretty straight forward, you need a top of the line, bleeding edge, $2500 (USD) PC ... 1994 style. The processor and RAM is mostly a non-factor because the 3DO Blaster ISA daughtercard is a full blown 3DO; there's no emulation (and thankfully no compatibility problems). It even has its own NVRAM so it doesn't use disk space for storing saved games, which was perceived as a hacking risk at the time). It even has a MPEG-1 decoder slot like the real 3DOs did, but Creative never made the decoder board. You'd want something in the range of a 486/DX2/66 or DX4/100 up to a Pentium based machine with no more than 64 Mb of EDO RAM (you'd probably only need 8 Mb of RAM for this). Anything faster, where you start approaching the class of a Pentium II, and Windows 3.1 will dump with a "Divide by 0" error. You'll want DOS 6.22 and Windows for Workgroups 3.11. You will want to ditch a NIC or modem and save the IRQs for the Creative stuff. You will also need to either find a still working hard drive smaller than 2Gb, or you'll need a different disk manager to partition a modern drive and allow DOS to format it with FAT without puking. A non-PnP -- e.g., an old school, jumpered -- Creative Soundcard is ideal, and you'll want the original, bona fide CR-563 double speed CD-ROM. The CR-563 was the CD-ROM back in the day, and was actually made by Panasonic and rebranded for Creative. Is is the model that was bundled with all Creative's soundcards at the dawn of the CD-ROM era. Lastly, you'll need a video board with VESA feature connector. 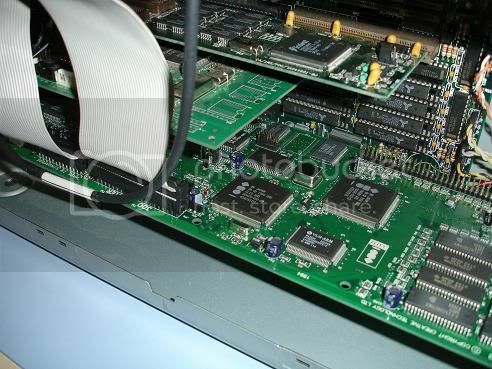 The VESA feature connector port disappeared around the time that Intel hit the 133-166 class Pentiums and 4Mb video cards were released to the home consumer targeting game playing. Really, you'd want the crappiest 1Mb Cirrus or Trident video card you can find, precisely the kind of card that discriminating gamers would absolutely not be caught dead with. Herein you see why the 3DO Blaster was doomed to failure. 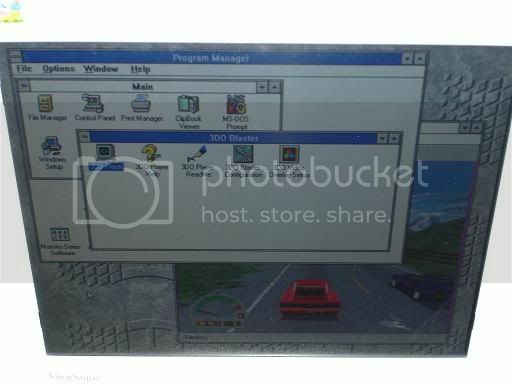 No gamer who would legitimately want to play 3DO on his PC would have a PC that sucked so hard to have all the compatible features. FWIW, Matrox cards did not have VESA feature connectors, though they did have 24-pin internal pass through port for MPEG decoders. The Matrox boards look like they had VESA feature connectors on them though, because of this, but they won't work. Stick with a generic Cirrus or Trident. I'd avoid the Diamond boards of the day too. Their drivers were crap. 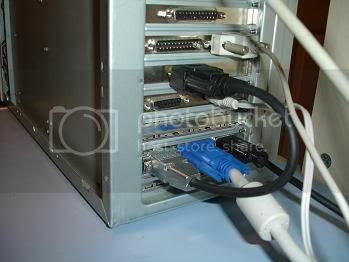 As for cables, you'll need VGA/VGA pass through for the back (the same type cable provided with all the 3Dfx boards), you'll need one 24-pin VESA feature connector ribbon (internally connects the VGA card to the 3DO Blaster), and you'll need another internal CD audio cable (you'll take the normal 3/4 wire cable that goes from the CD-ROM to the soundcard and instead run it CD-ROM to 3DO Blaster, then another goes from 3DO Blaster to soundcard). I have bought a 3do blaster alone and the seller show me a site that i bought a cd-rom cr-563-b for, if remember correct 5-10usd. so that wont be a problem its easy to find one. Dryden wrote: I've worked in I.T./Telecom for more than 10 years. Trust me when I say that all I need is the board. I remember wanting to buy one of these way back in the day. I was on the quest for the 3d0 blaster a few years ago cuz i was hell bent on getting RGB video. But good job on getting it working!